Ryan Estrada made this image and shared it on Google+. 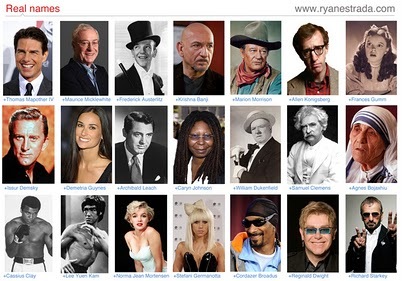 I note that Google+ seems to be OK with Lady Gaga going by Lady Gaga. Presumably they’d be OK with Christopher George Latore Wallace going by The Notorious B.I.G. (although if someone’s posting as him today, there’s another issue with veracity). So if everyone knows me as Raq Winchester, even if that’s not on my photo ID, we should be cool, yeah? Those of us who made it into the Google+ beta before they shut down invites (or got hacked into it afterwards) had a good laugh when we discovered that Zuckerberg was in the beta. There was instant doubt. Is it really him? I think it is – I mean, why wouldn’t he? If I were him I’d be in the beta. But I think it’s interesting that the reaction is immediate suspicion of identity. “Fake until proven real” seems to be the rule for folks who spend a lot of cycles on social media. Sadly, “real until proven fake” seems to be the starting point for everyone else.